BIRMINGHAM, Ala. (April 27, 2015) – Top the practice speed charts. Start on pole. Sweep two races in one weekend. It’s becoming a habit for Kelly Moss Motorsports and Colin Thompson. That’s just what they did during Rounds 6 and 7 of the Pirelli World Challenge Championship® GT Cup presented by MOMO on April 25-26 at Barber Motorsports Park. Thompson continued his dominance of the GT Cup field on a track he was familiar with but had never raced. Thompson spent time at the Alabama facility at the end of last season as a participant in the Porsche Young Driver’s Academy. Kelly Moss-TruSpeed Autosport partnership driver Sloan Urry also participated in the Porsche Young Driver Academy last season. Urry and Alec Udell, who missed the Long Beach event, battled Thompson for most of the first race. Despite various lead changes, Thompson took the checkered flag in first. Race 2 was a slightly different story. Thompson got a clean start and quickly extended his lead over the rest of the field. With 14 minutes left, Thompson had built an 11-second lead and was the only GT Cup car to have not been lapped by the GT field. A full-course caution period bunched the field. On the restart, Thompson once again had a clean start and pulled away for a 2.959-second victory over Udell. Thompson has won six of the seven races this season. The Kelly Moss-TruSpeed partnership has won all seven. The Kelly Moss team continued to push for victory despite entering the race weekend with a 154-point lead in the standings. The championship is always in the forefront of strategy and preparation. “Every race we treat like we’re so far behind that we need to push,” Thomspon said. “The whole Kelly Moss team goes in as a unit. We’re always looking for more. That’s the only way we can maintain this point lead and take the championship. The team will have a short break from PWC action before GT Cup Rounds 8 and 9 on May 15-17 at Canadian Tire Motorsport Park in Bowmanville, Ontario. Thompson will get some rest and resume training and video and data analysis. 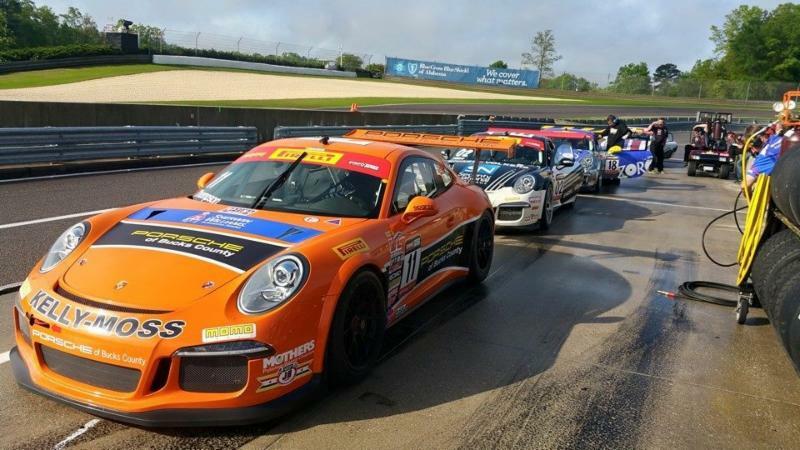 The team heads to Circuit of the Americas next week for a Porsche Club of America race and will test the following week at Watkins Glen International with its Porsche GT3 Cup Challenge USA by Yokohama competitors en route to Canadian Tire Motorsport Park.